1 – Without included optional headers. 2 – Without a heat sink or forced air flow. 3 – With sufficient additional cooling. 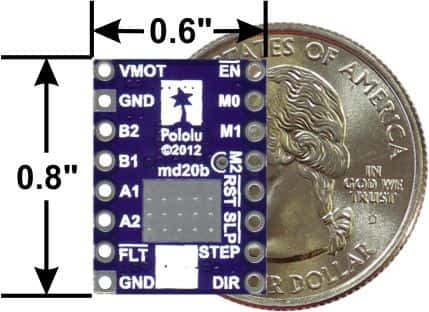 4 – This driver works with 2.5 V to 5.25 V logic. It does not take an external logic power supply. 5 – Male header pins are included for the board’s 16 holes, but they are not installed. 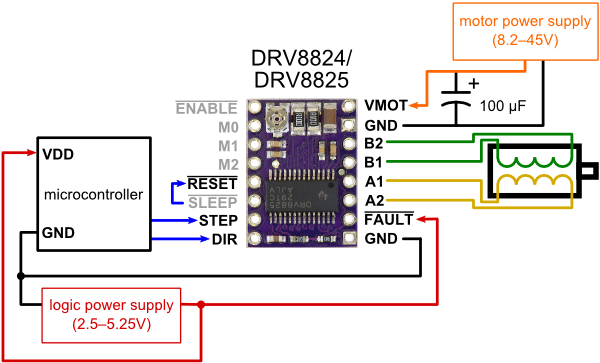 – The DRV8834 carrier works with motor supply voltages as low as 2.5 V, making it suitable for low-voltage applications. – The DRV8880 carrier offers dynamically scalable current limiting and “AutoTune”, which automatically selects the decay mode each PWM cycle for optimal current regulation performance based on factors like the motor winding resistance and inductance and the motor’s dynamic speed and load. 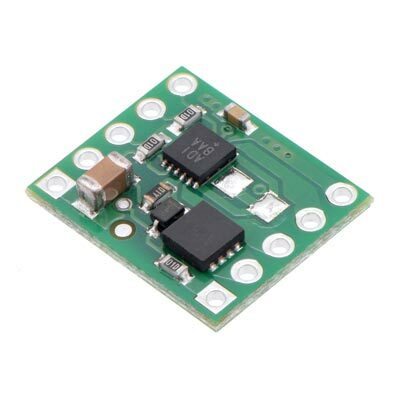 – The MP6500 carrier can deliver up to 1.5 A per phase (continuous) without a heat sink and is available in two versions, one with a pot for controlling the current limit and one with digital current limit control for dynamic current limit adjustment by a microcontroller. 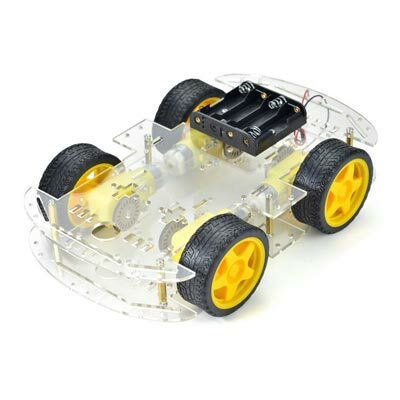 – The Black Edition A4988 stepper motor driver carrier is a higher performance version of our original A4988 carrier. The current sense resistors (R2 and R3) on the DRV8825 carrier are 0.100 Ω. 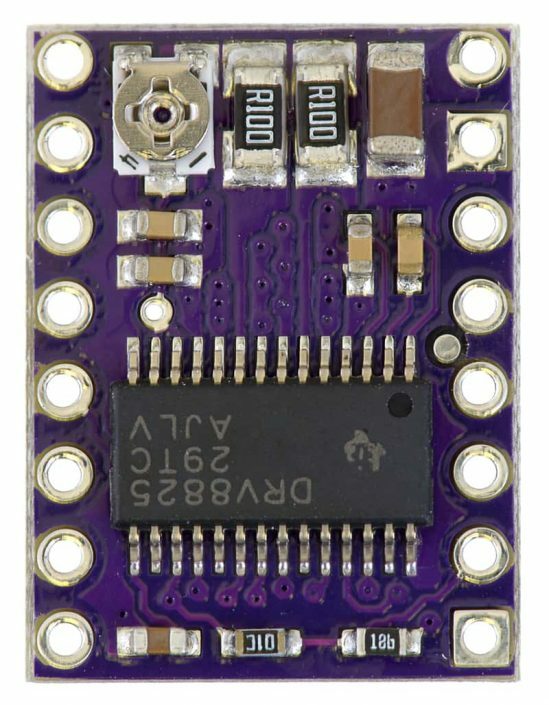 – The pin used to supply logic voltage to the A4988 is used as the DRV8825’s FAULT output, since the DRV8825 does not require a logic supply (and the A4988 does not have a fault output). 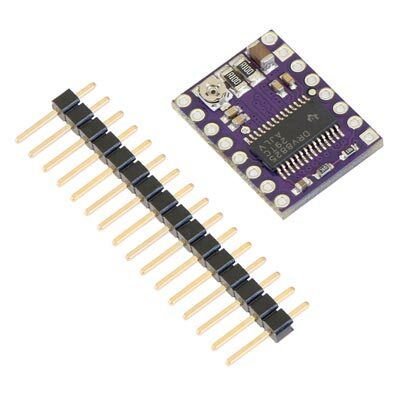 Note that it is safe to connect the FAULT pin directly to a logic supply (there is a 1.5k resistor between the IC output and the pin to protect it), so the DRV8825 module can be used in systems designed for the A4988 that route logic power to this pin. 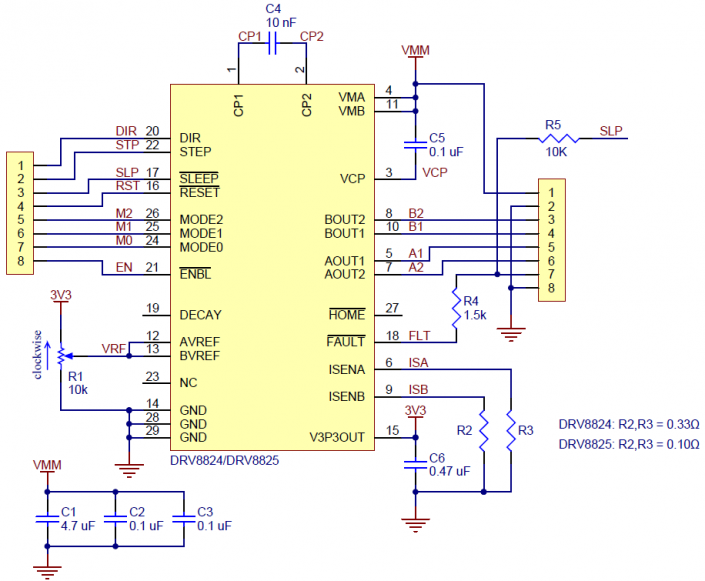 – The current limit potentiometer is in a different location. – The relationship between the current limit setting and the reference pin voltage is different. 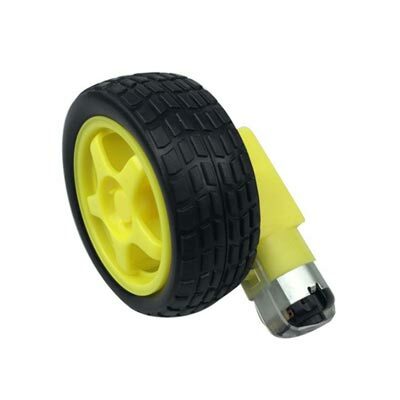 – The DRV8825 offers 1/32-step microstepping; the A4988 only goes down to 1/16-step. 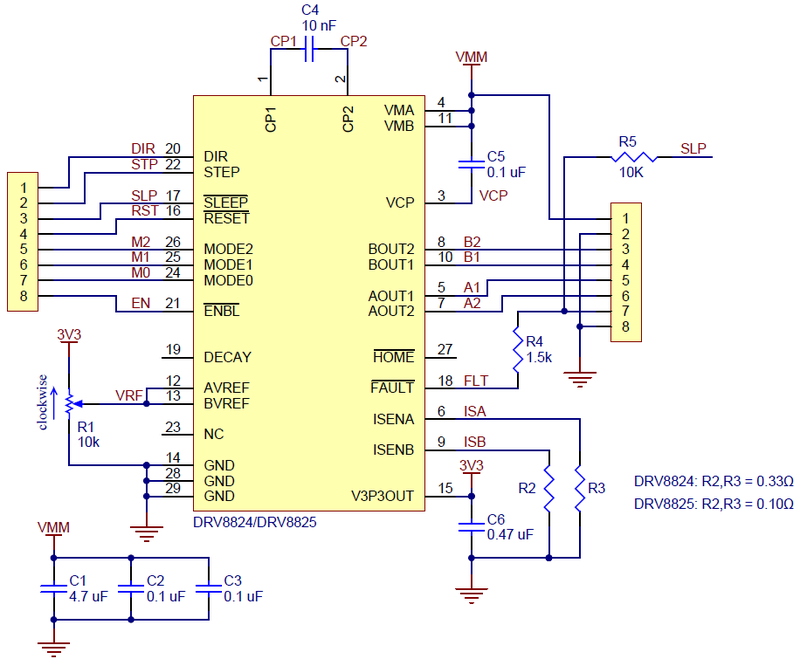 – The mode selection pin inputs corresponding to 1/16-step on the A4988 result in 1/32-step microstepping on the DRV8825. 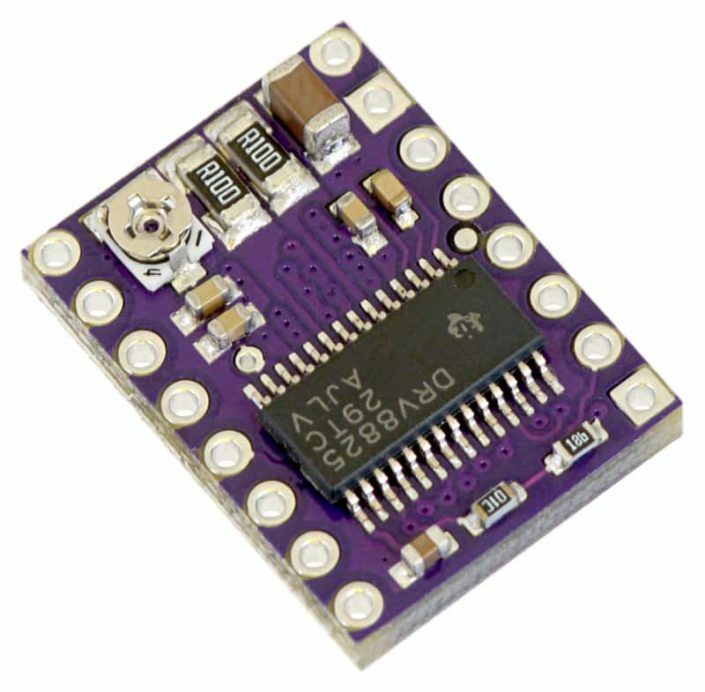 For all other microstepping resolutions, the step selection table is the same for both the DRV8825 and the A4988. – The timing requirements for minimum pulse durations on the STEP pin are different for the two drivers. 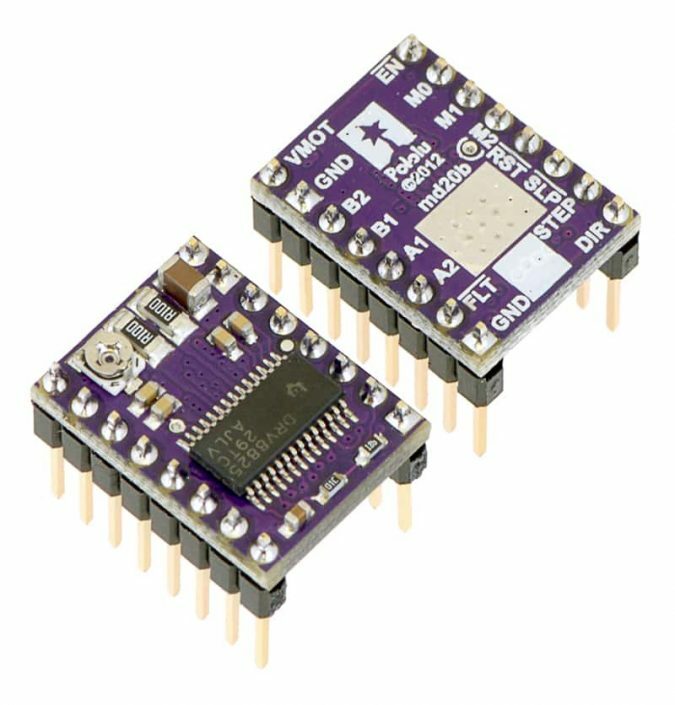 With the DRV8825, the high and low STEP pulses must each be at least 1.9 us; they can be as short as 1 us when using the A4988. 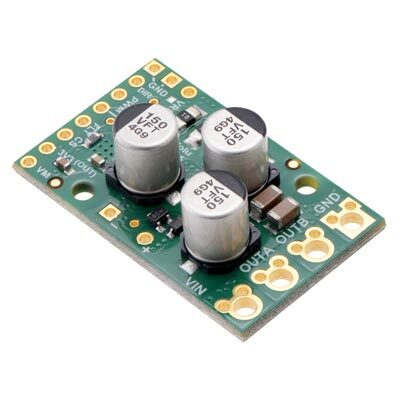 – The DRV8825 has a higher maximum supply voltage than the A4988 (45 V vs 35 V), which means the DRV8825 can be used more safely at higher voltages and is less susceptible to damage from LC voltage spikes. – The DRV8825 can deliver more current than the A4988 without any additional cooling (based on our full-step tests: 1.5 A per coil for the DRV8825 vs 1.2 A per coil for the A4988 Black Edition and 1 A per coil for the original A4988 carrier). 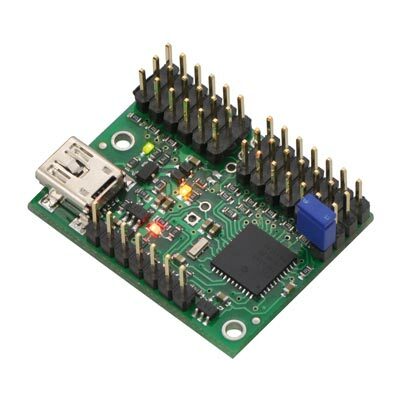 – The DRV8825 uses a different naming convention for the stepper motor outputs, but they are functionally the same as the corresponding pins on the A4988 carrier, so the same connections to both drivers result in the same stepper motor behavior. On both boards, the first part of the label identifies the coil (so you have coils “A” and “B” on the DRV8825 and coils “1” and “2” on the A4988). – For those with color-sensitive applications, note that the DRV8825 carrier is purple.